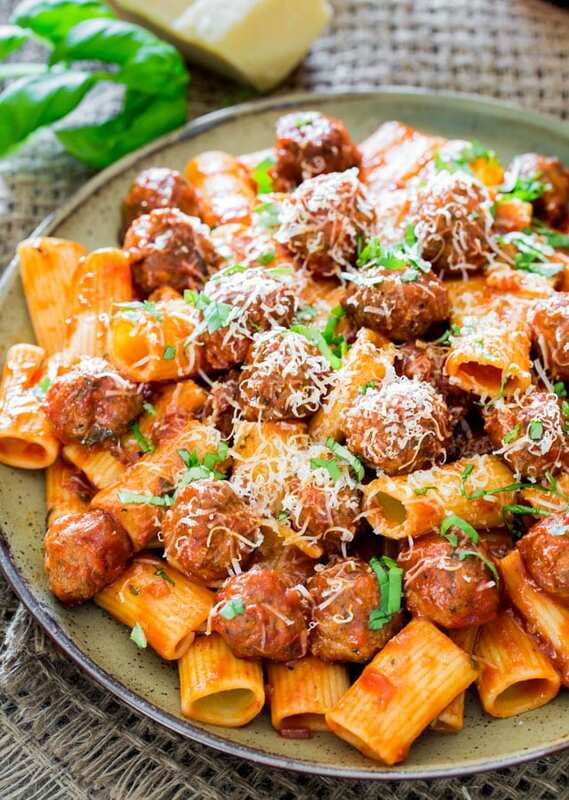 Rigatoni con Polpette and Arrabiata Sauce – no doubt one of the best pasta dinners you can have. Casual yet sophisticated, this pasta dish is sure to please the entire family. Back to my love of meatballs. I really am a sucker for a good meatball and I really don’t need an excuse to make them. 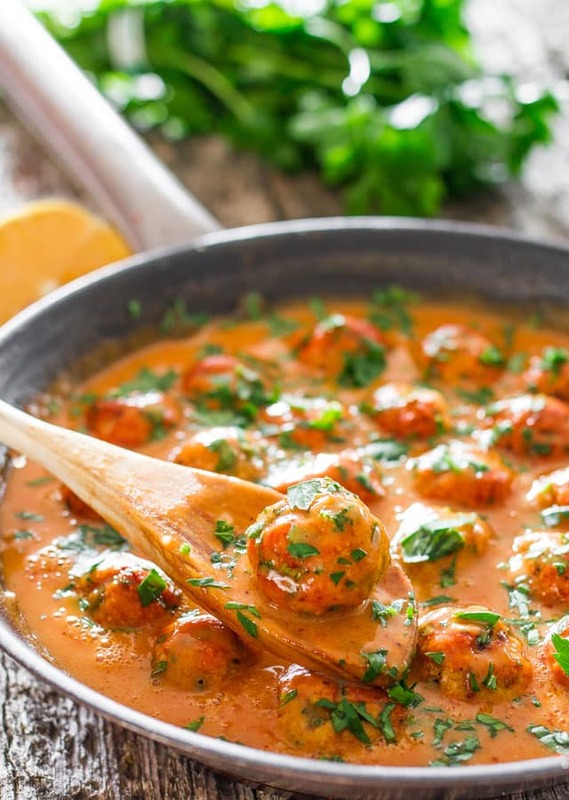 Here I wanted to pair these meatballs with one of my favorite sauces, Arrabiata which really means angry in Italian, meaning it’s very spicy. And spicy it is! So this recipe is for all the spicy food lovers out there, you know who you are. 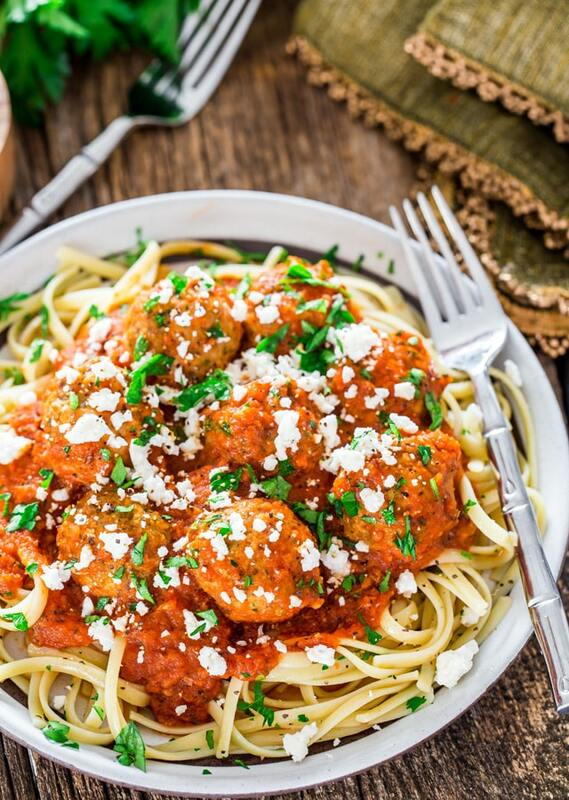 Polpette means meatballs in Italian and these meatballs are made with ground beef and ground pork. I always like to mix ground meat when I make meatballs. I know some of you are going to ask if you can buy store bought meatballs and the answer is yes of course. 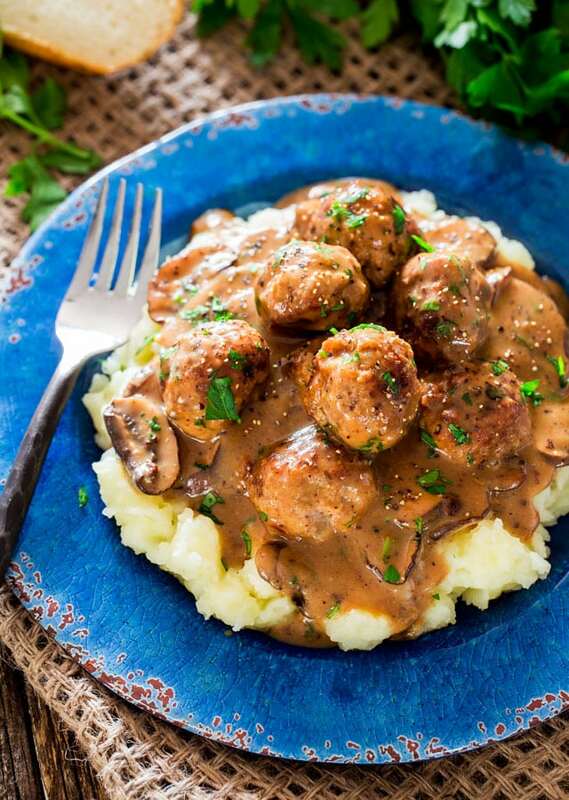 If you want to save time you can always use store bought meatballs. 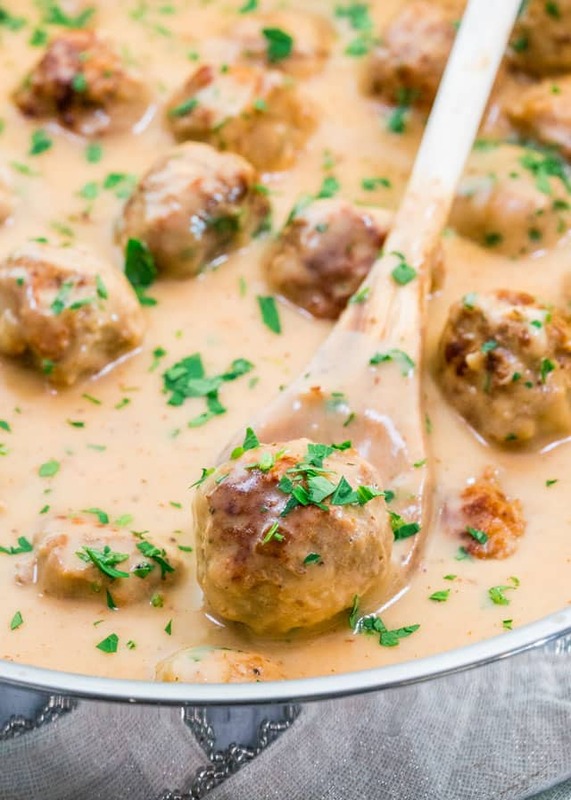 But if you’re in the mood of cooking one lazy Saturday afternoon and want to make something delicious while listening to your favorite music, have some quiet time in the kitchen if you know what I mean, then make these meatballs. I baked these meatballs, but you can fry them, in all my meatball recipes here you’ll see that sometimes I fry my meatballs and sometimes I bake them. Totally up to you. If you want to go healthier then obviously bake them. And don’t worry about them being dry or anything because we will cook these with the sauce later on so they’re going to be plenty moist. But this Arrabiata sauce is the bomb and you won’t believe how simple it is. Onions, garlic, red wine, hot sauce and crushed tomatoes, that’s basically it. 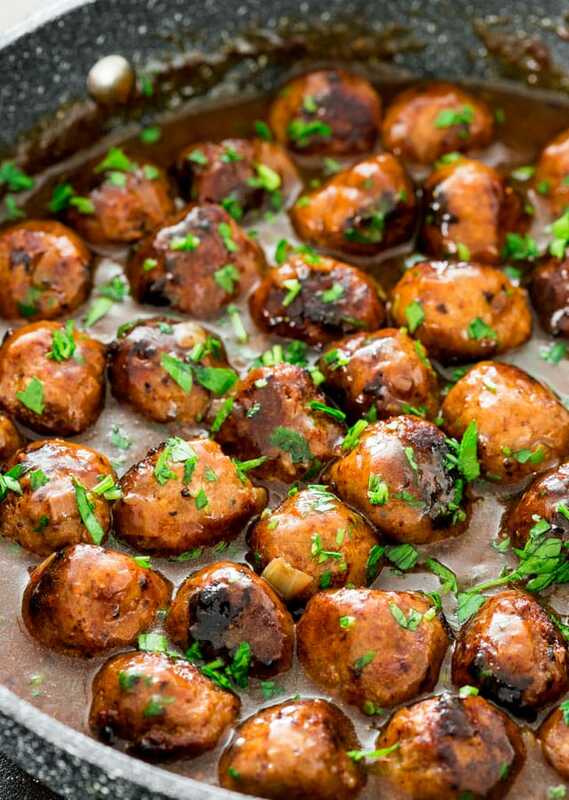 And I’m not talking a splash of wine, I added a whole cup of wine in this sauce so you end up with this dark and rich very flavorful sauce. Because this was a labor of love I did simmer this sauce for a bit, and for the last 10 minutes I added the meatballs so they can cook a bit more and soak up some of the yummy sauce. It’s all about love. 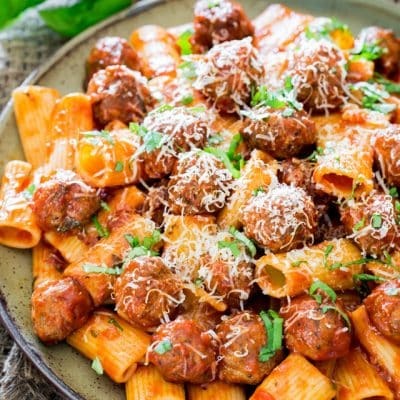 Rigatoni was my pasta of choice here, but really use whatever you want, I just love rigatoni with these small meatballs because you can take a rigatoni and a meatball all in one bite and it’s like you’ve died and gone to heaven. Really this is one of the best dinners you could have and pretty cheap too. Now hurry, get to your kitchen and spread the love. 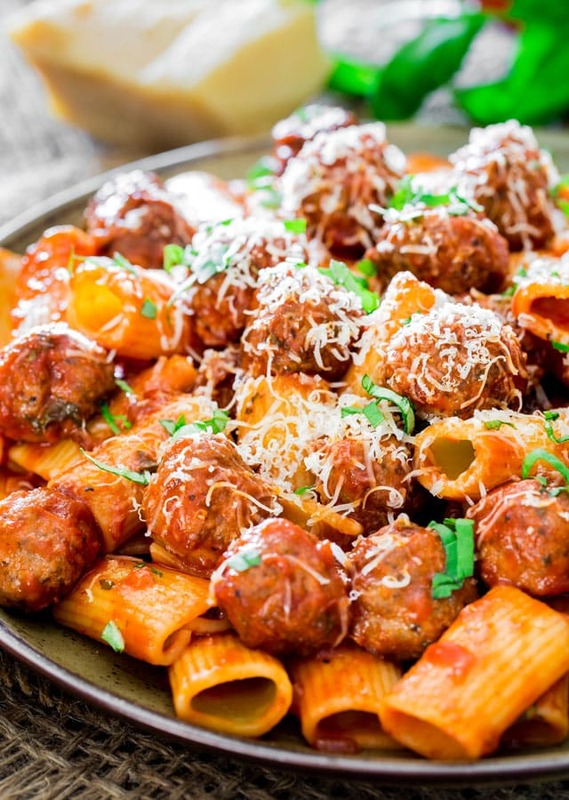 Rigatoni con Polpette and Arrabiata Sauce - no doubt one of the best pasta dinners you can have. Casual yet sophisticated, this pasta dish is sure to please the entire family. Preheat oven to 375 F degrees. Place parchment paper over a baking sheet or spray it with cooking spray. In a medium bowl mix all the ingredients for the meatballs together well. 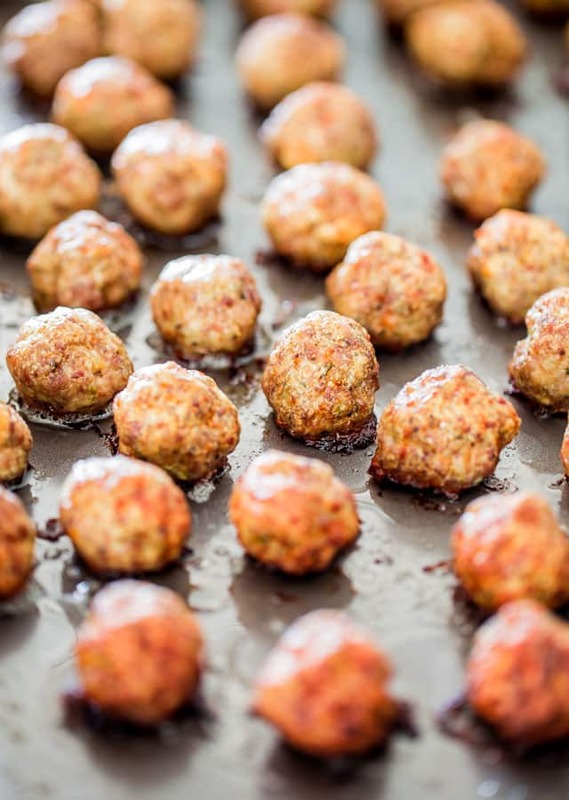 Form the meatballs into small 1 inch balls. Mine were pretty small so I got about 60 meatballs. 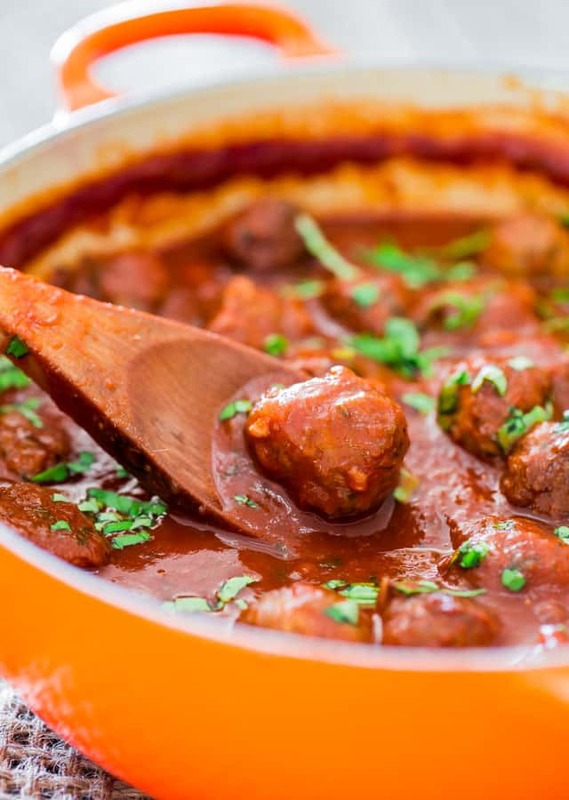 Place meatballs on prepared baking sheet and bake for about 30 minutes or until done. In a Dutch oven or a large pot heat the olive oil. Add the onion and garlic and cook for about 5 minutes or until onion is soft and starts to brown a bit, make sure you don't burn it though. Stir in the dried oregano and red chili flakes. Add the wine and cook for another 5 minutes until the alcohol burns off a bit. Stir in the crushed tomatoes, chicken broth, hot sauce, basil leaves and season with salt and pepper. Turn the heat down to medium-low and let this simmer for 10 minutes. After 10 minutes you can start cooking the rigatoni according to package instructions. If you like your pasta al dente cook it for 2 minutes less than indicated on the package. Add the meatballs to the sauce and simmer for another 10 minutes. 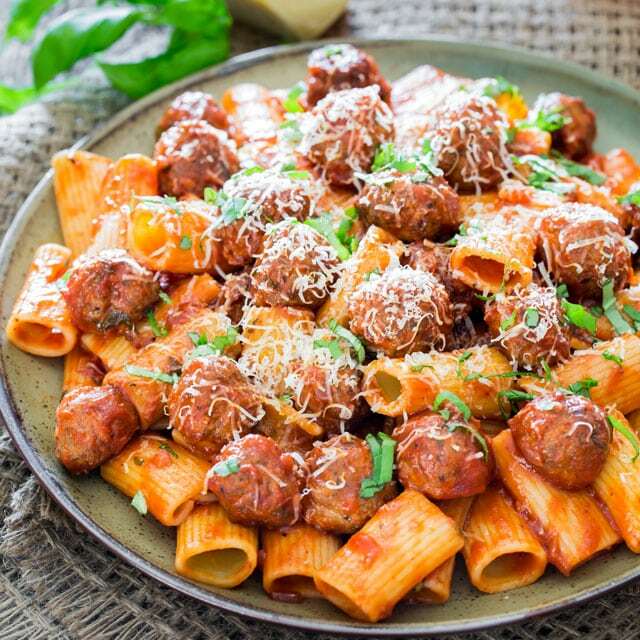 Pour the sauce and meatballs over the rigatoni, sprinkle some Parmesan cheese and basil over and serve. This looks like my ideal comfort food – just begging to be paired with lots of crusty bread and olive oil (all of the carbs!!). Definitely saving to try, thanks Jo! This is real comfort food, Jo! 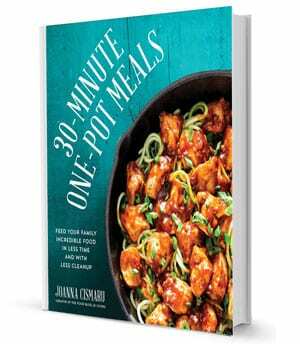 This sounds delicious and am looking forward to making it. Can you suggest a replacement for the wine? Would I simply add more chicken broth? Tad of balsamic vinegar? Yeah if you don’t want the wine, then just add another cup of chicken broth. 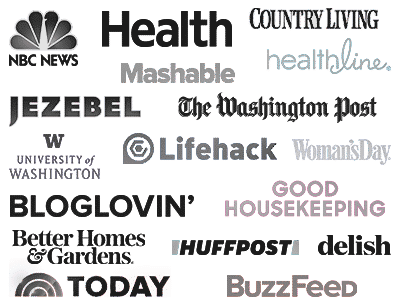 I’ve been looking for an arrabiata recipe for so long and have just recently switched from the jarred Classico tomato sauces to using organic crushed tomatoes-what a difference! I had no idea that chicken stock was used in this kind of sauce, but knew it was spicy. Will have to try this sauce! I just added chicken stock to thin it out a bit as it was too thick, not really for anything else.